There are almost constant applications to fell trees within the conservation area. I am very aware that dead, dying or dangerous trees or those causing structural damage qualify for felling. Others come forward to facilitate development or because owners do not like them. Tree cover is a fundamental component of the Ludlow townscape, providing a foil to the tight knit street frontages. As trees are felled and not replaced, the balance is being eroded. I would like to see a “one out, one in” policy, making it incumbent on landowners to replant after felling. This requirement might be in public areas if it would be difficult to achieve on the original site. All trees in a conservation area are considered protected. The way it works is that trees in a conservation area are protected as though they were subject to a Tree Preservation Order (TPO), meaning that owners must apply to Shropshire Council to manage or fell a tree. The council has six weeks to decide whether to object to the work, which it can only do by making the tree subject to a TPO. In most cases, the council registers “no objection”. The application is also passed to Ludlow Town Council which must comment in time to influence Shropshire Council’s decision. The public also have an opportunity to comment. Flowchart of decision making (PDF). Sound reasons are usually given for felling a tree. A tree might be undermining a wall or foundation. A garden might become overcrowded as trees grow. It might be threatening sheds or overhead wires. One 14-metre high pear tree was felled because the owner could not get house insurance due to its proximity to the house. The applicant also complained shade from the tree ruined enjoyment of the garden and falling pears discouraged gardening. Over the three years, 31 Leylandii were felled and 17 other cypress. Eighteen fruit trees, 12 birches and four beech trees were axed. Three yews and one oak were chopped down. There is no obligation on applicants to replace felled trees or to tell Shropshire Council that they plan to do so. Applications mention that of the 126 trees felled, 34 replacements were planned to be planted. Replacements are rarely the same species with a preference for smaller, slower growing trees. Replanting will not always be appropriate, for example where a group of trees is being thinned out to allow the strongest specimens to grow. I am told by tree experts that there has been a significant change in how people view trees in their gardens. People are much less tolerant of trees than in the past and the work is often carried out by tree surgeons who do not have good arboricultural knowledge. It is an un-regulated industry. Properties change hands at a higher frequency than in the past and it has become noticeable how estate agents and surveyors often view trees as a constraint rather than an asset. New occupants are sometimes less comfortable with trees than previous owners who have grown used to them. As my email correspondent said, trees are a vital part of the character of Ludlow’s townscape. None of us would wish to see a town centre denuded of trees. The loss of around 30 trees a year without replacement could have a significant impact on the beauty and ecology of our conservation areas in the long term. We need to keep a close eye on what is happening. It would be useful if Shropshire Council produced guidance advising applicants to state whether they plan to replace a tree. 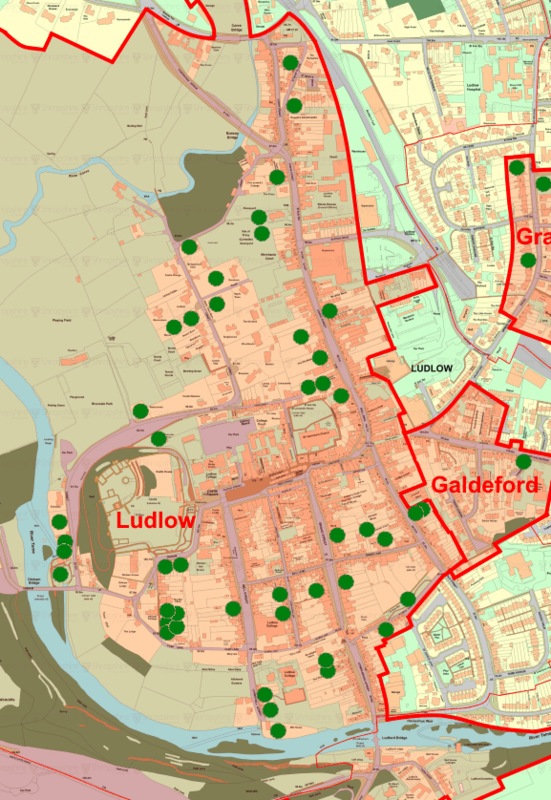 Decisions must still be made on the merits of the case for felling the existing tree but information on replacements will help us monitor overall changes to the tree canopy in Ludlow. The felling of an Ailanthus Altissima (tree of heaven) in St Julian’s Avenue also generated controversy. The owners said the tree was blocking access but objectors said alternative access could easily be provided, thereby preserving a valued tree. Neighbours didn’t agree saying the tree had become a nuisance, saying it was too close to neighbouring houses, telephone lines and the road. However, the town council supported the application. Shropshire Council agreed and said, “the reasons given for the removal are fair.” It pointed out that any refusal would almost certainly result in the decision being overturned by the planning inspectorate and the tree being removed anyway. A proposal to fell four yews and one cypress in St Leonard’s churchyard split opinion. Two residents objected and the town council supported the removal of the yews but not the cypress. The yews were between 100 and 150 years old and the objective was to thin a clump of yews allowing the remaining yews to grow. The cypress was showing early signs of rot and was too close to the west end of the former church. The council said the rot was minor and there was no evidence that the tree was affecting the building. It said it should be protected by a TPO. Shropshire Council successfully argued for the retention of one yew tree but did not think the cypress merited a TPO. It said the cypress could benefit from a crown reduction but “the likely safe useful life expectancy of the tree is less than a decade.” Felling of the tree would also improve view of the church. An earlier application to remove an ash tree and a cypress led to debate but was approved, subject to replacement.
. My apologies for the bad pun of the month.
. This analysis excludes Whitcliffe Common. My survey period is September 2014 to August 2017.
. Each green dot is a successful application, not a single tree. Pink shading indicates conservation areas. In the light of conservation concerns would it not be simple instead of all the pontificating to simply make a rule that for every tree removed in the design one has to be planted.